Banned Books Week started yesterday and continues through October 6. Co-chair of the celebration, Bill Moyers, describes his connection with books and the importance of universal access to them in this short and persuasive video. In it, Moyers talks about the first books he borrowed from his local library and about being a freshman in college and his elation at seeing the school’s library for the first time. He was so impressed and inspired he considered majoring in library science so that “[he] could be near all those books.” He goes on to talk about why it’s so important to fight this form of censorship. Moyers’ video is viewable on a youtube channel dedicated to the subject as part of a Virtual Read-Out. You can read a passage from a banned book and record it for broadcast here or just see what choices other supporters of the event have chosen to read. I particularly enjoyed the passage from the Great Gatsby read by Christine Hadlow at the Missoula public library in Montana. The language in the scene in which Nick becomes reacquainted with Daisy and meets Jordan for the first time may be even more affecting when read aloud than when read silently. The American Library Association web site provides this description of this celebration of freedom from censorship. Banned Books Week is the national book community's annual celebration of the freedom to read. Hundreds of libraries and bookstores around the country draw attention to the problem of censorship by mounting displays of challenged books and hosting a variety of events. 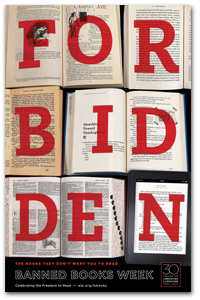 The 2012 celebration of Banned Books Week will be held from September 30 through October 6. Banned Books Week was launched in 1982 in response to a sudden surge in the number of challenges to books in schools, bookstores and libraries. More than 11,300 books have been challenged since 1982. For more information on Banned Books Week, click here. It’s startling to see a list where the Gossip Girl series sits side-by-side with To Kill a Mockingbird, but of course I think readers should be able to read either one if they wish to. Moreover, I don’t think reason is the strong suit of those who would impose their morality or politics on the global community of readers. Look for more links of interest on the ALA website, including the most frequently challenged authors of the 21st century. * Any thoughts on what might make the list next year?